When I was a kid I had several movies that I watched over and over and over, such as “Back to the Future”, “The Karate Kid”, and so on. 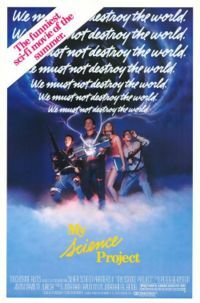 But one of my favorites was a movie called “My Science Project.” I remember watching this with my cousins a lot, and thinking it was the coolest movie ever. “My Science Project” was released in August of 1985, which means it probably made its way to Blackstone in late 1986 or early 1987, which would have been when I was around 7 or 8. The scene that has stuck in my head all these years is when the main character, “Motorhead Mike” is racing his red GTO against an electrical current that is passing from electrical tower to tower. Mike has to get ahead of the current so that he can destroy a tower down the line and prevent it from… well, doing something, I’m not quite sure. Mike is neck and neck with the electrical current when he hits the nitrous and roars past it and reaches the tower in time to blow it up and end the chain. Motorhead Mike was cool because his souped up car saved the town! This scene was really inspiring to me as a kid as it showed that humans are amazing because we can build machines that can do anything, even outrun electricity (in the movies). Twenty years after I stopped watching this movie, I still remembered that scene. Last week I finally watched it again, and I realized something. “My Science Project” is an absolutely terrible movie. I don’t watch many movies, and I can hardly claim to be a good critic, but I am just glad that movies like this aren’t being made anymore. (or are they?) It was so cheesy that I could barely stand watching it all the way through, even though I really wanted to see it again. I was happy when it was over. But, as I was thinking about this more, I realized something about kids. Even with all the crap in this movie, the part I remembered was the part that I found most inspiring. As a kid I was able to find something meaningful in this really dumb teen sci-fi thriller. So I wonder if kids are better at seeing through the crap and finding something of value. The main character was a young boy who was an inventor. I remember a scene where he was welding. There was a scene with him rolling on rollerskates on train tracks. There was something like a mechanical loch ness monster in a pond or lake that he had some sort of encounter with. I imagine the movie came out in the mid 1980′s as well. Anyone have any suggestions?